Sam Cole as Tommy, Waleed Akhtar as Zia and Laurence Walker as Luke. Back Down is the debut play by Steven Camden aka Polarbear, an award winning performance poet from Birmingham. It's a cute coming of age story, a kind of Inbetweeners meets Stand By Me. Luke (Lawrence Walker) is off to university with his girlfriend and is aware that for his two best mates Zia (Waleed Akhtar) and Tommy (Sam Cole) life will never be the same again. The three Brummie teenagers decide on one last trip together to mark their friendship so decide to climb a mountain — and pick Snowdon. 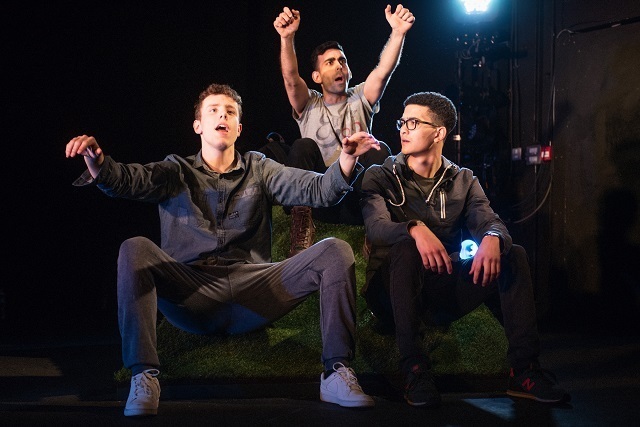 The journey is played out by the three actors through a mix of spoken word addressed to the fourth wall and more traditional theatrical narrative. Buzzing with excitement after gearing up for the trip with a new mix tape, the boys end up encountering knock back after knock back en route involving an ex-SAS veteran, a bunch of German girls and a bottle of booze, all the while they are kept sodden by awful weather. Director Tessa Walker has put together a strong diverse cast each actor having a distinctive style. Their squabbles are both hilarious and endearing and at times extremely touching, for example when their competitive banter reveals their inner thoughts and fears. Zia wants to make more of his life than selling carpets in the family business, Tommy has his booze and drugs and over-embellished stories to sort out, and Luke is having a hard time negotiating friendship while being under the thumb. This mash-up on a mountain is funny and endearing though at times overly earnest, however the sentimentality is perhaps warranted by characters who haven't yet become jaded adults. Back Down runs at The Roundhouse until 24 May . Tickets £5-15 . Londonist saw this play on a complimentary ticket.